Visiting faculty who have been invited to University of Limerick can choose from a number of accommodation options available to suit both long and short term requirements. Short term accommodation can be reserved on either a per night or per week basis in Brennan Court Guesthouse for up to three months where both self-catering and bed and breakfast serviced accommodation is provided. Long term accommodation options in one bed faculty apartments are available for academic staff who require accommodation from three months to a year. 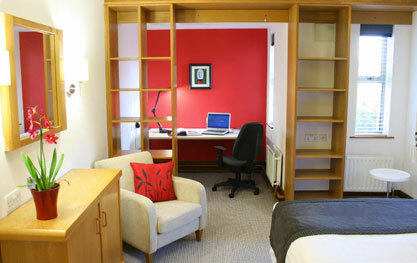 All faculty accommodation facilities are well appointed with comfortable facilities. Rental fees are inclusive of all utility bills while our village management team take care of all housing and maintenance services. Accommodation is also offered through out the summer season mid May to the end of August for visiting corporate clients. For more information please see our brochure. If these options are not suitable or unavailable click here to search for properties / rooms in the local area for rent. Brennan Court Guesthouse is located in Kilmurry Village. Located close to the University Arena and five minutes' walk to the university buildings, the Guesthouse offers comfortable en suite bedrooms ideal for short stays on campus. Read more. For stays over three months, long term faculty accommodation is available in one bedroom apartments in Kilmurry and Thomond Villages. Rental fees include all utilities and services. Read more. Planning a staycation in Ireland this Summer?